When you go for a walk in the woods and see almost nothing except distant ravens, what do you do? You take a picture of a squirrel in a tree. An intimate moment sensitively captured and graciously shared. Actually it’s easy to think of many and much worse things to do of a cold Sunday afternoon. I’ve never seen a sweeter-looking squirrel, and a trace of La Gioconda in that smile, no? Pamella, your remark immediately made me think of Ponchielli’s opera, La Geoconda. But, what had its odd plot have to do with smiles? Ah, it finally dawned on me: Mona Lisa was actually the wife of Francesco del Giocondo. OK that works, for I had also noted the enigmatic smile on the squirrel. 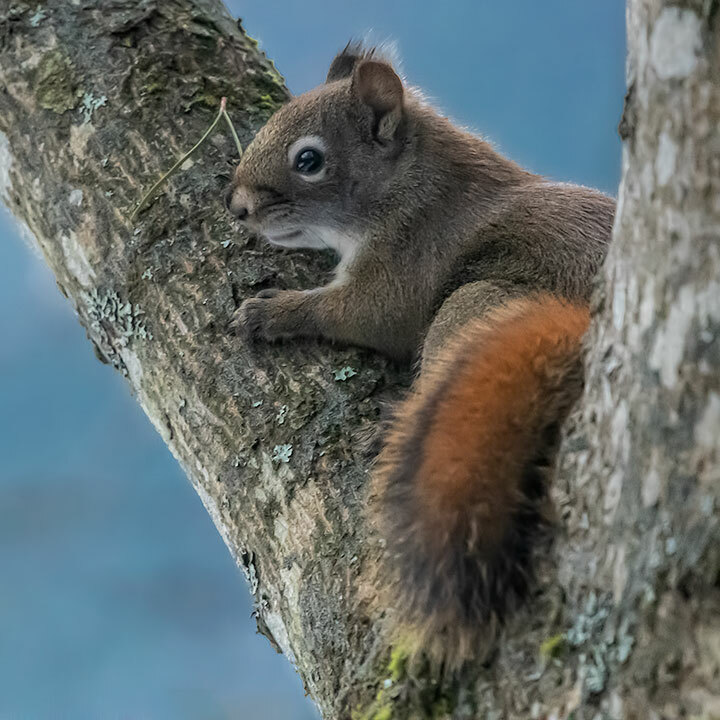 Very nice detail of the squirrel. I always enjoy seeing pure Consciousness in the eyes of animals. Squirrels are smart and they can communicate with humans. The day after my husband must have plugged the last hole between the attic and the outdoors a squirrel came to visit him while he lay in bed. The squirrel made a little noise, Ray looked down at it; the squirrel looked back. Ray got up and moved towards it. The squirrel moved to the door. Ray followed. The squirrel ran to the top of the stairs and looked back at him. Ray obediently followed. The squirrel ran down the stairs and looked back at him. And so it went until the squirrel ran to the patio doors and waited. Ray went over. The squirrel jumped into a plant pot while he opened the doors. Then the squirrel made its escape!